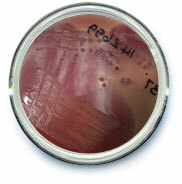 Coliforms are used to identify the "cleanliness" of food and water. Coliform species are abundant in faeces but are also found in soil and vegetation. Although the group does contain some pathogenic species the coliform test is generally carried out to indicate potential contamination with other pathogenic spp. E.coli is a member of the group but is more specifically associated with faecal matter and as such is a better indication of faecal contamination. If you are an existing client and would like further technical data on this species please contact the lab for instructions on how to access and a passcode which is required to obtain this information.